Opa! Transport yourself to Greece with a trip to one of these incredible restaurants in California. If it's Greek food you're in the mood for, California has options from Los Angeles to Sacramento. Spanakopita, shawarma, souvlaki, and more! Here are the most delicious Greek restaurants in the state. Driving across the desolate California desert doesn’t offer much to do except stare out the window at the arid landscape. Until the small town of Baker, where you’ll come across a blue and white restaurant reminiscent of something you’d find in the Greek isles. White columns and goddess statues are a welcome sight, but the gift of the gods here is the food. Gyros, spanakopita, and shawarma top the list of favorites, but don’t miss the justly named world-famous, refreshing strawberry shake. With more than 3,000 imported goods from Greece you’d be hard-pressed not to find something evocative of that Mediterranean culture. This family-operated business has been providing Greek food stuffs in the market, deli, and bakery for more than 60 years. It’s considered one of the best spots in the city for kebobs, oktapodakia, souvlaki and gyros. Stop by on Thursday evening and join in the “My Big Fat Greek Family-Style Dinner,” and…give belly dancing a try. A little romance is in the air at this charming taverna. Sit outside, even in winter with the heaters keeping things toasty, under the twinkling fairy lights, near the angelic fountain statue and you might just propose … a toast! 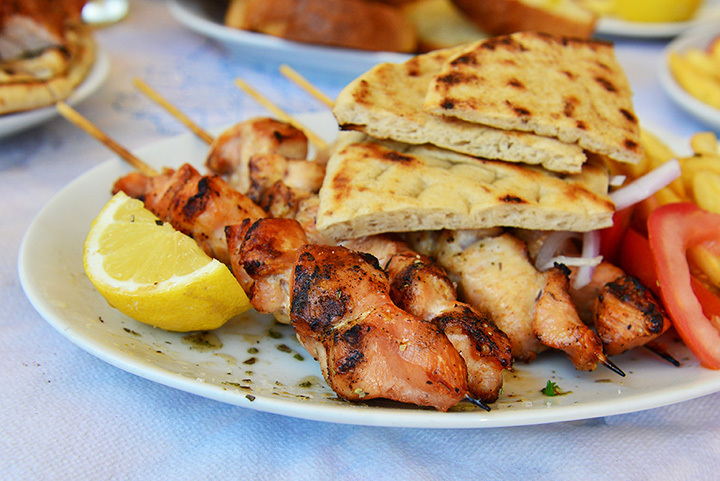 Say ya mas to the delicious, authentic food, paired with a glass of ouzo or glass of wine. Of course, there’s moussaka, falafel, souvlaki and gyros, but don’t miss the baklava a la mode. There’s a reason it was voted best Greek restaurant by OC Weekly. Late night hankering for a gyro? This is the place to satisfy that craving. The food is traditional. Savory meats, made the traditional way on a vertical rotisserie, are thinly sliced, tender morsels of either lamb, beef, pork or chicken, served on a warm pita bread filled with fries, plus other tasty ingredients. The souvlaki on a stick and the tyropita, phylo dough stuffed with cheese are delicious. But the gold medal winner is the Avgolemono, a luscious lemon soup. Stop by for lunch, dinner, happy hour or at two in the morning—you won’t go home hungry. White tablecloths and blue napkins honor the colors of the Greek flag at this charming cafe. Authentic dishes are prepared daily with fresh ingredients and classic spices. There’s a mural on the wall with the words, “My Big Fat Greek Family,” and the ambiance supports that sentiment—all are welcomed. The food is a mix of known favorites and some surprises. Gyros, falafel and souvlaki are, as expected, delicious. Step outside the box and try the Pastitsio, Grecian lasagna or Aginares Me Araka, artichokes unlike anything you’ve tasted. Open for lunch and dinner, plus happy hour special. Simple elegance is evidenced in the design of the restaurant, as well as the food. That’s the Greek way—less is more, substance over style. Dishes here focus on ensuring diners actually taste the classic Greek flavors. Begin a meal with one of the delicious spreads served with house-made pita bread. Small plates offer diners the chance for variety—stuffed grape leaves, pan-fried cheese or charbroiled octopus are enough for a meal. The main courses are filling, especially the lamb shank, so leave room for loukoumathes, Greek donuts topped with fudge and honey syrup. There’s a Greek love story behind the name of this restaurant. Of course, it ended in tragedy, as most do, but the moral inspired the concept of cuisine “fit for the gods.” That’s what you’ll find here. The aromas are intoxicating—from the wood oven where dishes are roasted to perfection to the spinning rotisserie of tender meats to the sizzling grill where on any given night you’ll find a whole fish or chicken. Dinner and lunch menus are similar, with small plates, soups, salads and entrees. The front of house has the feel of your favorite living room, while the back taverna is for the more enthusiastic diner. Waffle garlic feta fries. Four words that will change the way you eat fries forever. Blink, and you might miss this tiny restaurant as you go through town, so be on the lookout for the blue and white sign. The gyros, loaded with meat, veggies and tzatziki, pair perfectly with the fries. Lighter fare includes a classic Greek salad, homemade vegan vegetable soup and grilled saganaki cheese on a pita. It’s take out only. Located in the harbor, you’ll see, from underneath the blue awning, blue water of the ocean, sailboats moored offshore and sunshine (it is California). With the aromas emanating from the kitchen, you could actually see Greece in your mind’s eye. This family-owned restaurant has been serving amazing Greek food for more than 20 years and entertaining diners with traditional Greek-style dancing and belly dancing shows. Open for lunch and dinner every day. This little Greek steki, or hangout, is the owner’s salute to her homeland and a desire to find a really good gyro to eat. There are three of these casual eateries, all showcasing authentic dishes, just like the owner’s grandmother made. The signature dish is, of course, the gyro, spit roasted lamb in a fluffy pita with homemade tzatziki. The menu is large, so you’ll find all of the country’s most popular dishes.